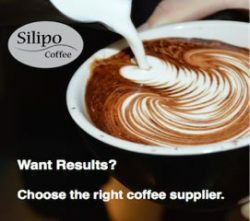 When it comes to coffee worldwide, Australians demand the best. So, we’re pleased to see another specialty roaster pop up in our midst late in 2018, especially one with such a wide and exceptional range of specialty coffees! 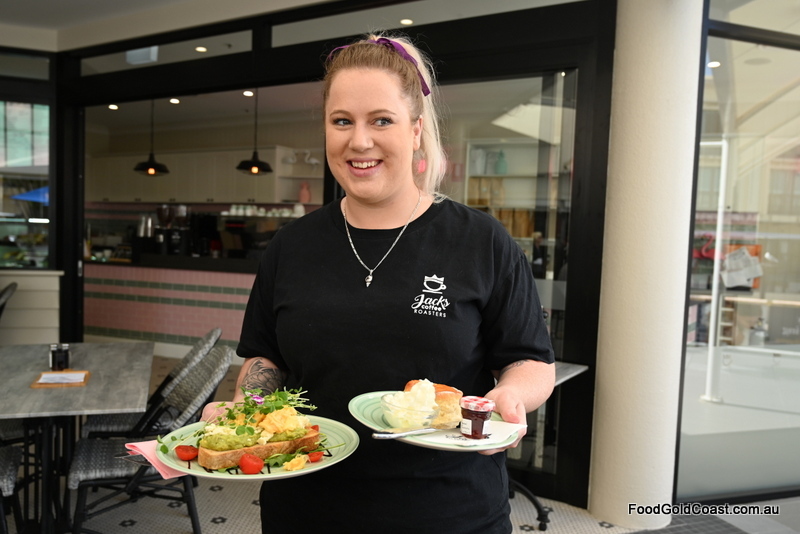 Dressed up in friendly pastel shades of musk pink and dusky green with pretty tiles and a couple of flamingos floating around, locally-owned Jack’s Coffee Roasters enjoys a pleasant open dining area facing both Palazzo Versace and Mirage’s marina and Broadwater beyond. In one corner stands the shiny new 7kg Phantom roaster, purchased locally from Coffee Roasters Australia, about to start production of house roasts of beans ethically sourced beans from local suppliers. It’s hard to beat Jonathon’s knowledge, talking coffee as though it were wine. 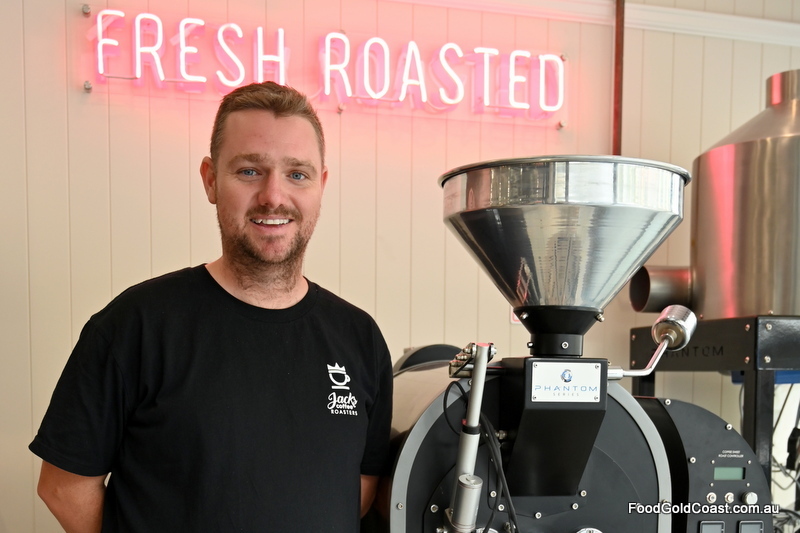 Following a career in bespoke luxury tourism through his business ‘Etiquette Marine’, he’s taken up the management of both Jack’s Coffee Roaster and nearby Cricelato Gelato. We’re treated to a coffee degustation: six coffee tastes accompanied by an assortment of treats from the café. 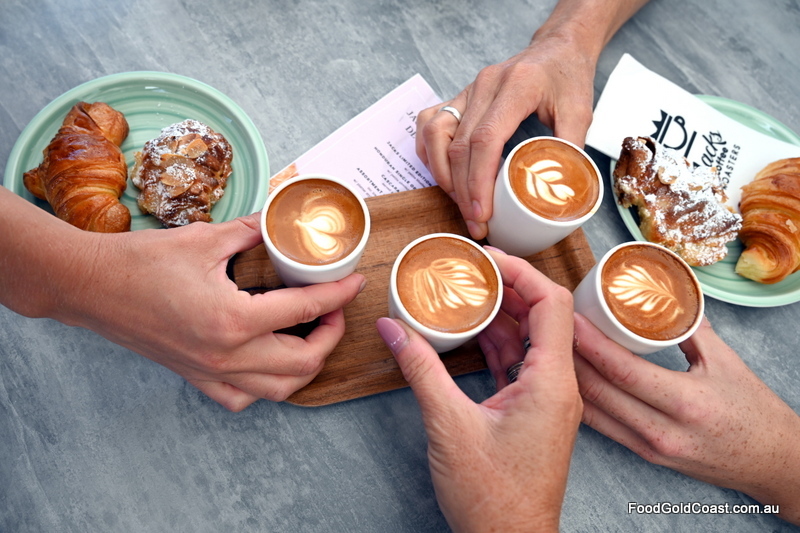 A blend of three unique coffees – the chocolatey flavours of Honduras, a Colombian micro-lot and the blueberry notes of Ethiopian Black Lion Arabica, the Summer Blend goes perfectly with petite blueberry tarts from My French Pastries. Jonathon explains the maturation of the roast, how volatile gases are released from Days 1 – 7, with Day 8 – 14 being the best time to drink the coffee. Different single origin coffees emerge throughout the year, with this one having a sweet chocolatey taste. Ground in an EK43 for consistency and fine-tuning of the grind, we learn that every shot is weighed separately at Jack’s, ‘dialled in’ using a recipe for each different coffee. Wind, sun and moisture all affect consistency. 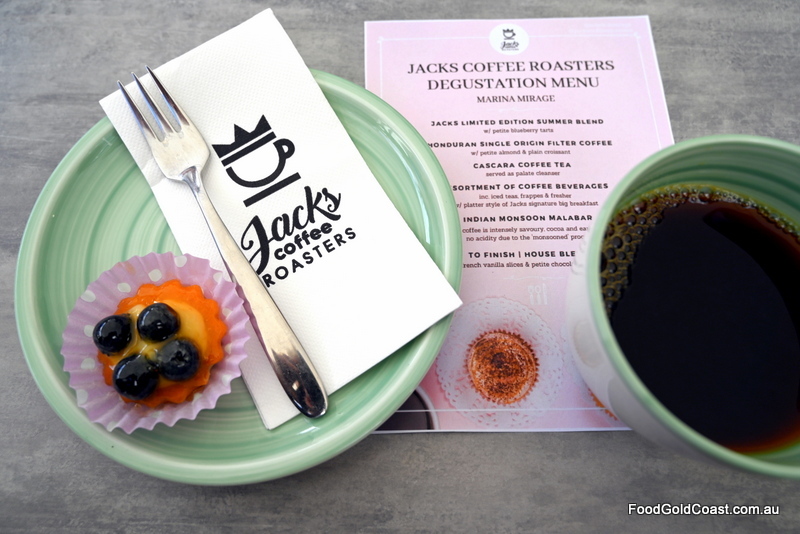 Jack’s serves a bottomless filter coffee as one of its options for $5.50pp. 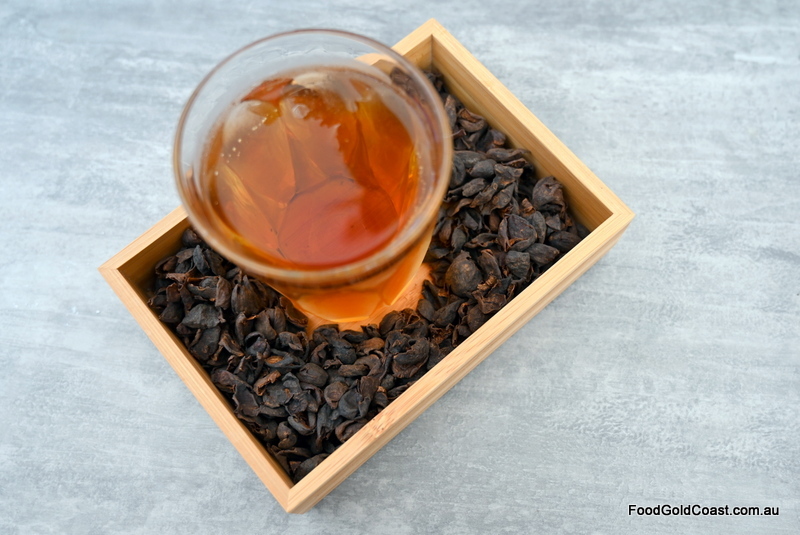 This Bolivian Cascara is like nothing I’ve tried before – a coffee made from the skins of the beans, batch brewed hot then chilled to serve as a palate cleanser. High in anti-oxidants and full of tannin from the coffee skins, the brew tastes like a mix between coffee and tea. 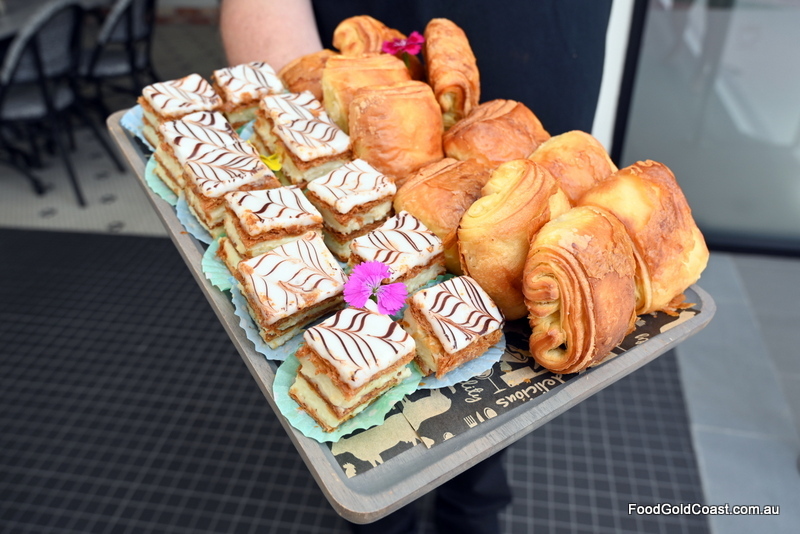 Salted caramel and white chocolate tasters are a smooth indulgence to accompany the delicious Big Brekkie. 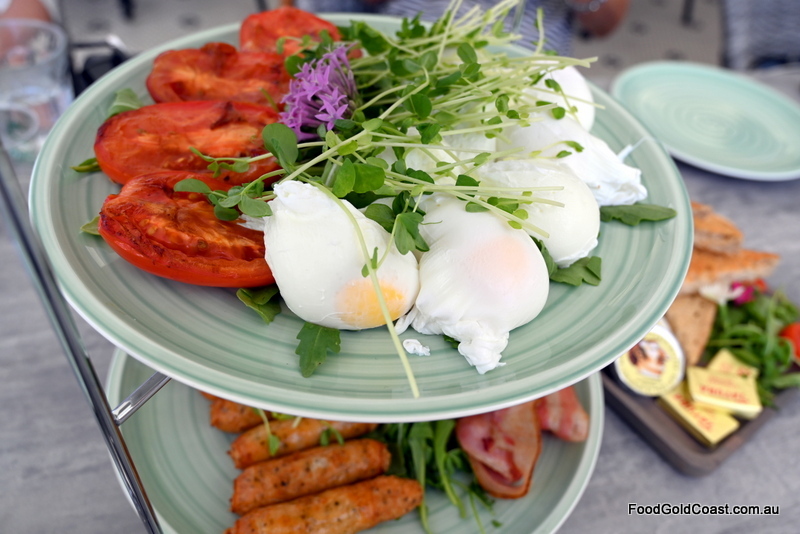 Using premium locally sourced products, such as Lucas Meats’ Bronte beechwood-smoked bacon, Emu Creek free range eggs, Mt Warning pork chipolatas and house-made baked beans, breakfast is delightfully relaxed overlooking the magnificent view. 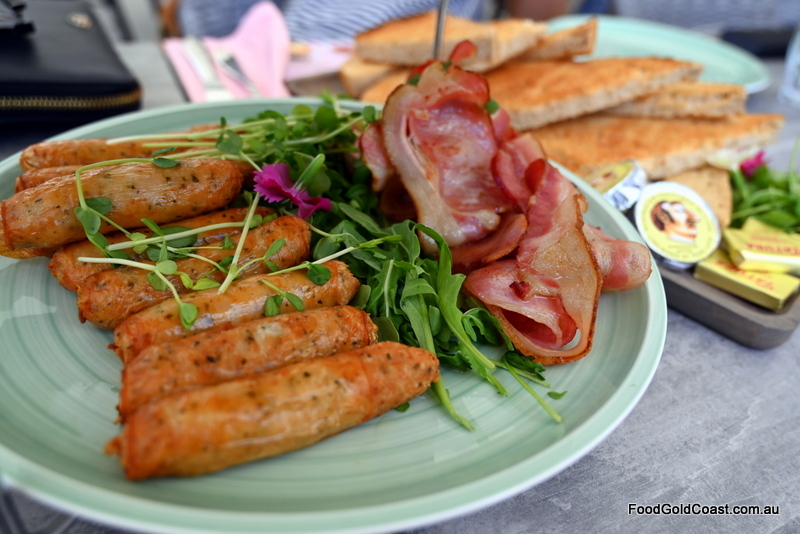 For me, a cold drip iced long black or a nitro coffee would accompany this breakfast very well on warmer days. Seeing house-made sourdough crumpets on the menu demands a return visit on cooler days when a flat white needs company! From the hillsides of Malabar on India’s southern coast, this unique Arabica coffee is intensely savoury and earthy with no acidity due to its unique preparation. The beans are left out in open sheds for the weather to take its toll, mimicking how coffee historically was carried by wooden ships in hessian bags, left exposed to rain and wind as they travelled on the deck. The store runs two house blends which Jonathon says took six months to design and blend: Milk Night, a blend of ‘the three Cs’ – Costa Rican, Colombian and Cuban beans complemented by the addition of milk, is rich, chocolatey and nutty with low acid and a finish of stone fruit; and Bold & the Beautiful, a Nicaraguan, Ethiopian and Ugandan blend with medium acidity to drink black. 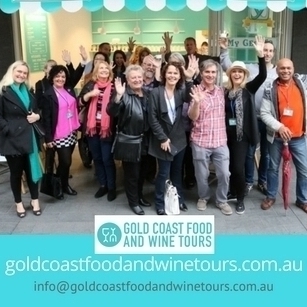 Though we feel that we’ve taken in more food and coffee than knowledge, this degustation was both interesting and delicious, widening our view of coffee varietals and possible coffee and food pairings. 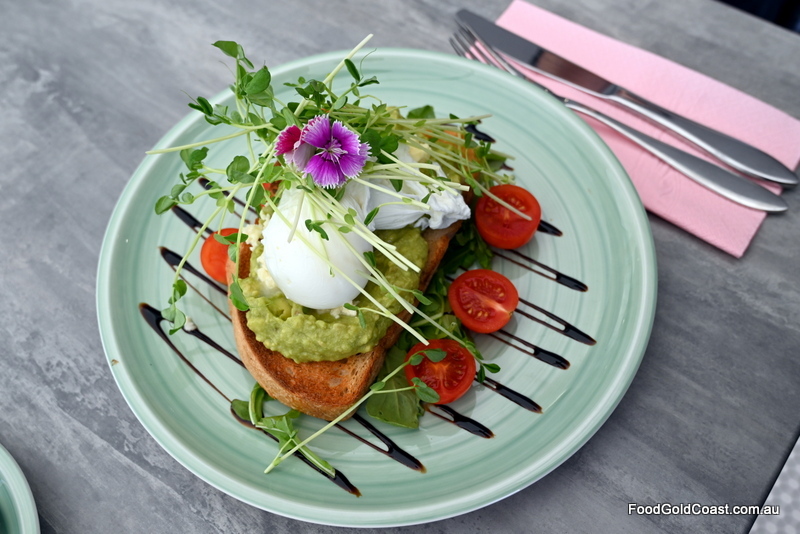 Open daily from 6.30am for coffee, breakfast from 7.30am until 5pm.